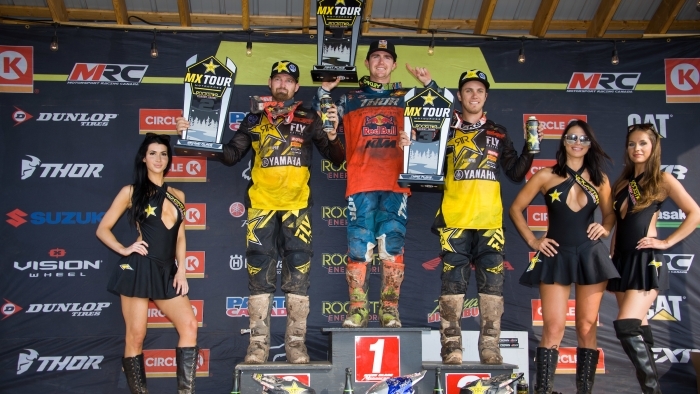 Round 7 of the Rockstar Energy Triple Crown Series MX Tour unfolded on a hot and humid Atlantic Coast afternoon, which added to the challenge of navigating the spectacular and difficult to pass on Riverglade track. As the series is now in its winding down stage, the racing was fast and furious, with positions in the top-10 points standings once again undergoing a bit of a shuffle. This was particularly true for Goerke. The Florida native gained some valuable ground, moving up into fourth place from fifth, just 30 points down from leader Colton Facciotti. For his part, Epstein has really picked up the pace since his earlier struggles in the western leg of the tour. The Californian currently sits sixth in the points, 33 points down from fifth place Tyler Medaglia. A top-five overall finish in the title hunt is still within reach for Epstein, who finished seventh in the series last year. With only two rounds left on the schedule, Facciotti enjoys a comfortable points cushion, but the championship is far from a done deal. Only three points separate Goerke from third place Kaven Benoit; only four from second place Cole Thompson. It’s still anybody’s title. In motocross, a lot can happen in four motos. Nothing is written in stone until the checkered flag drops on the final moto of the series. In Saturday’s 450 Pro action, the start of moto 1 was anything but an auspicious beginning for Goerke: He got stuck in the gate while the rest of the field were unleashed and on their way. The pack was already around the first corner before Goerke even managed to get unstuck from behind the gate. But once he was off and running, he pinned the throttle of his YZ450F as if there would be no tomorrow. By the midway point of the moto he had blitzed his way into seventh place. By the end of the moto he was in third, less than a second behind second place running Epstein as they crossed finished line. Considering he was the fastest rider on the track, it’s no stretch to speculate that Goerke could have won the moto if he had gotten a good start. Unfortunately, speculation doesn’t count for points. Still, considering the odds, it’s safe to say the defending champion once again proved that when faced with extreme adversity he has an abundance of true grit and unyielding courage to overcome it. Epstein, meanwhile, claimed a top-five start in moto one. In a race where the frontrunners weren’t giving away any favours, he clawed his way past heavy-hitters like Cole Thompson, Jacob Hayes, and Tyler Medaglia to install himself in second place behind winner Colton Facciotti. The start of the second moto saw both Goerke and Epstein in good position as the freight train thundered into turn 1. Goerke sat in fourth while his teammate was a few positions behind in sixth. Once again, the battle for position and championship points was on the edge, with Kaven Benoit leading the pack. Hayes and Thompson stood between Goerke and Benoit but only Hayes would succumb to Goerke’s relentless attacks. Epstein also had his hands full with Hayes, whom he managed to stick a pass on around the midway mark of the moto. Nothing else changed after that, with Benoit picking up the win, Thompson taking second and Goerke and Epstein recording third and fourth respectively. It was another weekend where good fortune proved to elusive for the team, but when all was said and done the final results were something to cheer about. “It was a great weekend for the team. After an up and down national for us at Gopher Dunes, everyone buckled down and worked twice as hard in Moncton. Matt and Dillan rode great. The second and third overall they finished the day with, not to mention the four-way tie in overall points at 50, awarded to the top-four finishers, is testimony of their effort,” team manager Steve Simms said. The Rockstar Energy Triple Crown Series continues on Saturday, August 4th, with Round 8 of the MX Tour at Motocross Deschambault in Deschambault, QC.